Emma and her father are always on the move, travelling from place to place as her father’s work demands. Their new home, however, is different. There’s a frightening woman who lives down the hall: she bears an uncanny resemblance to a witch. A mysterious light comes from her apartment, and a small boy seems to be trapped inside. School in this town is no happy place either, with an odd principal and a gang of girls who make tormenting Emma their special project. And strangest of all is the fact that there seem to be brownies - basement brownies, in the air vent in her bedroom. Haunted by visions of her mother, Emma travels through the brownie burrow to the valley of Hades to visit with the goddess Ceres, following a series of clues that lead her across the sea of memory to the centre of the world. There, on an inhospitable rock floating in a sea of steaming lava, Emma must find a way to release her mother from the sea of memory and restore magic to both the brownie burrow and the human world above. Root Bound is definitely a nice little break from all the Young Adult/New Adult titles I've been reading lately. It's a light Middle Grade read filled with magic, adventure and all kinds of cute! Now what I really liked about this book was the author's attention to detail. Gough did an incredible job at describing everything and everyone. Sometimes I think the descriptions were a bit to long but that didn't really ruin the experience for me; it only made it better. I was able to picture the world of Under and all the places they went. I was also able to imagine how some houses are actually alive because they're rooted to the world below. It was so much fun entering the world that Root Bound was set in. I just love it when a book challenges my imagination! In addition to that, I liked how the adventures were told in such a way that the story picked up at key parts and it slowed down at the appropriate times as well. The author's storytelling is really something. She also did an amazing job creating characters who were so much fun to read and added substance to the story. First we have Emma, of course. She's an easy-going kid who's quite the pushover when it comes to bullies if you ask me but of course she was able to rise above that (not a spoiler, you just know it's bound to happen). At first I didn't like her very much because she seemed a bit generic to me but once she was with the brownies and all the magical folk, she was such a delight! I also liked the basement brownies so much. I didn't have the faintest idea what they were prior to reading Root Bound but I was able to picture them because of the descriptions given and the way they spoke. I Googled basement brownies and turns out my imagination was spot on. They're the part of the story that I refer to as "all kinds of cute." They had such varied personalities and I think they really added more magic to the story. One other thing I liked about Root Bound was the Greek/Roman mythology tie-in. I happen to enjoy Greek/Roman mythology so I think that's definitely a plus. All kinds of folklore were incorporated in the story well and it didn't appear like an unfortunate mash of everything all at once. If you're up for a Middle Grade read filled with adventure and magic, Root Bound is for you. You'll never be bored because you'll definitely enjoy the world that Tanya Karen Gough has created! Tanya Karen Gough was born in Montreal, Quebec and raised in New England, where she developed a healthy appetite for ghosts and things that go bump in the night. An avid reader from a young age, she quickly worked her way through Alice in Wonderland, the Magical Monarch of Mo, Andrew Lang's Fairy Books, all of the Tintin comic books, Nancy Drew, and most of the other books in the children's library. The best place is at home"
To date, she has moved more than 25 times. Along the way, she earned two degrees in English Literature, taught overseas, became the owner operator of the Poor Yorick Shakespeare Catalogue, and contributed to a number of Shakespeare-related publications. 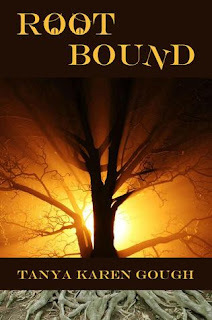 Root Bound is the first of four books in the Emma and the Elementals series. Thanks for the giveaway! Btw, I'm a new follower and I'd I really appreciate it if you'd return the favor by following me back at Forever YA.